For proof that fact is stranger than fiction, you need look no further than the strange case of Bernie Tiede. With Bernie, director Richard Linklater brings us into Carthage, and also into his own Texas heritage, his own investment in Tiede’s story. Linklater had followed the case in the paper, and then even attended court while the man was being tried. This was always going to be a strange story to tell, and according to Linklater, a veteran independent film director, “it took 12 years to happen,” but with a minor budget of $6 million and 22 days to shoot, it finally made it to the screen. Presented in a faux-documentary style, Bernie mixes fact with fiction. Half its narrative is composed of interviews with Carthaginians that knew Bernie, some of whom are played by the real East Texas natives. The other half dramatizes the life of Bernie Tiede (Jack Black), gregarious Assistant Funeral Director, and his relationship with the richest, most cold-hearted widow in town, Marjorie “Marge” Nugent (Shirley MacLaine). 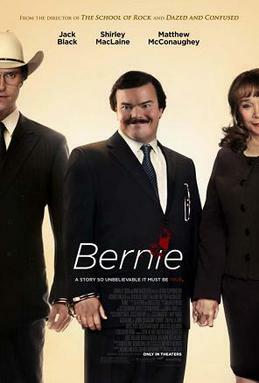 Whether you know the real Bernie Tiede shot Marjorie Nugent four times in the back one mid-November day or not, it is easily guessed that something untoward has prompted the interviewer’s curiosity in Bernie, as well as his effect on the small town of 6,500. It isn’t cheating you out of too much of a surprise to explain this fifteen years after the event, for Linklater’s film is a character study, not a drama. If the film has a genre it is black comedy, though the film is as much a character study of Carthage as it is about Bernie, and there isn’t a word for that genre. In life and in film, Bernie is an effeminate man who, to paraphrase one resident, brought light to Carthage. He is beloved by the town, as an attentive mortician, churchgoer, choir member, community theatre director, happy to give gifts he cannot afford or help his friends with their taxes. He is a sweet man, or very good at playing one. Jack Black abandons his comedic leap-and-leer antics to inhabit the reserved, Christian soul of Bernie Tiede. And though it is hard for me to take anything Mr. Black says seriously, he plays Tiede like a sugary teddy graham with nary a trace of insincerity. When he begins his friendship, or courtship, with Marge Nugent, it is undeniable that he improves her life, even if his motive remains a mystery. That is the magic act of the film, and why its documentary style feels appropriate. The facts are these: That Bernie initiated a long-term relationship with the widow Nugent (visiting her with gifts and flowers as he had many widows in the past), then spent several years on expensive vacations with her, doting on her, becoming her constant companion until he replaced her son in her will. When he killed her, he could have easily hidden her body. He chose to preserve her in a refrigerator instead. He then went on to use his power of attorney to donate Mrs. Nugent’s money to his church, schools, friends and neighbors, buying jet skis and playhouses and cars. He kept little for himself, and it was nearly a year before anyone questioned where Mrs. Nugent was. Bernie was a pillar of the community even before he had Nugent’s money to play with, and when his crime was discovered, there were a great many in town who said to hell with the law, Bernie should be forgiven (though not as unanimously as in the film). District Attorney Danny Buck Davidson (Matthew McConaughey) must pull an unprecedented legal stunt and relocate Bernie’s trial out of the county just to find a jury that won’t acquit him. The problem with Bernie is that he’s too likeable. And though McConaughey plays Davidson as an understated but self-aggrandizing yutz, he is on the right side of the law. Linklater’s portrait of Carthage and of Bernie is affectionate but self aware. Wrong has been committed. Murder, in fact. And yet here is this contradiction, a supreme sin performed by a sentimental man. It is the same opposing thoughts that compose Carthage’s polite but old school manners, the film asking without asking how they can be reconciled, and how much difference personal relations makes to our relationship with the law. It is a comedy, in its way, but also a tragedy. Bernie’s ultimate fate is unjust, but so was Marge Nugent’s. Linklater’s film respects the facts and still entertains, and yet it is deceptively poignant.